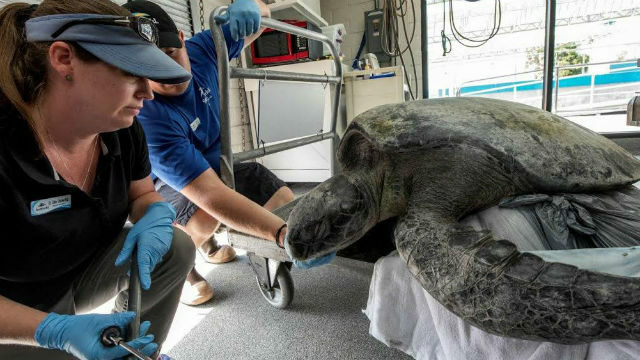 A green sea turtle estimated to be 40 to 50 years old was undergoing treatment at SeaWorld San Diego Thursday after being rescued from a salt marsh in South San Diego Bay. Park officials said the 250-pound turtle, part of a threatened species, was discovered Wednesday in a saltwater evaporation pond and showed signs of lethargy and severe dehydration. The animal also wasn’t exhibiting the behavior typical of an adult sea turtle. Veterinarians conducted a full examination of the turtle to determine if its circumstances were the result of a medical condition, according to SeaWorld. The turtle is the fifth rescued by SeaWorld San Diego so far this year. SeaWorld San Diego is the only zoological facility on the U.S. West Coast capable of providing long-term rehabilitative care to rescued sea turtles.